Ambient Magnetic Fields arrived on Sept 11 2002. It is Morrisons tribute to the victims of Sept 11. The X-Men travel to Genosha, one year after the mutant kingdom ruled by Magneto was terminated in a vicious attack by Sentinels. Sixteen million mutants died. The plot revolves around the survivors. 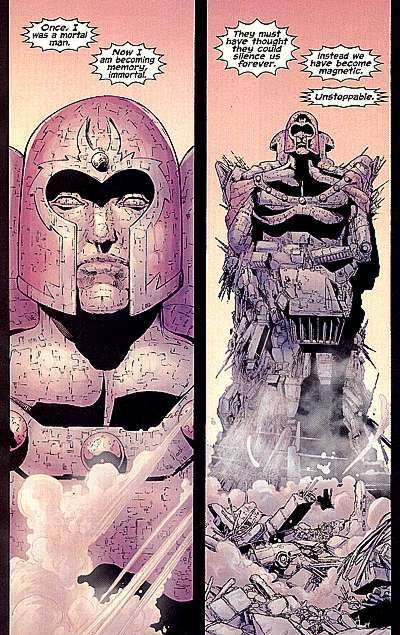 Magnetos original team of "evil mutants" have gathered to build a monument to their leader. Magnetos purpose gets explained another way by original "evil mutant" the Toad. all Magneto ever wanted Xavier? He wanted you to admit that human beings were murderous scum. He only ever wanted you to admit he was right." In the middle of all the explaining, Magnetos adopted daughter Lorna Dane is found. The former X-Men known as Polaris is insane with her fathers memories locked in her magnetic field. It appears Magneto had been recording all the memories of the 16 million mutants in Genosha and has preserved them all for eternity in a "little black box" to be replayed forever. The point I think Morrison is trying to make is one of "communication". 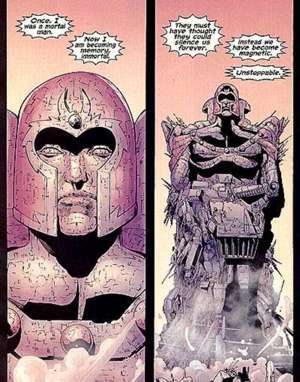 How it is so difficult for two powerful men like Professor X and Magneto to come to terms with a simple point as to who was right about the human race. It is this simple disagreement that resulted in years of fighting and violence with victims on both sides.